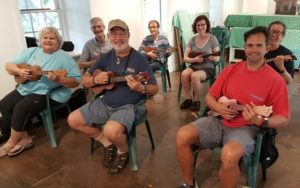 Seven people attended the January 2018 Ukulele Strumming Workshop by Ukulele Mele at the Bailey House on Maui. Seven people attended my 45th ‘Ukulele Strumming Workshop on Saturday, January 20 at the Bailey House in Wailuku bringing the total to 638 served since the workshops began on July 14, 2012. My goal is to introduce people to my unique method for forming ukulele chords with minimal muscle strain and strumming styles taught by no one else. Four people came from the mainland and three were local residents. I enjoyed seeing two individuals from Massachusetts and California on their annual trip to Maui who came back to learn more from attending my previous workshops, private lessons, and classes. Before the workshop started a man played “Five Foot Two Eyes of Blue” and Rich played u-bass and I called out the ukulele chords as all the early birds to the workshop played the song by ear. Later I suggested he apply my Hum Ding-Ah Strum to make the song sound better. Horse with No Name – 2-chords with Chalang-Alang Strum. Lion Sleeps Tonight – 3-chords with Chalang-Alang Strum. She’ll Be Comin’ ‘Round the Mountain – 3-chords with Hum Ding-Ah Strum. Hawaii Aloha – 4-chords with Morse Code Strum. Plus, I demonstrated how playing other strums to the same song affects the mood of what you want to express. In other words, there is more than one way to play a song and you are in the driver’s seat to convey the feeling by the way you play the rhythm. Single Song lesson download (for only that song). Sing-Along Songs Vol. 1 packaged set of book/DVD/CD (for that song and 5 others with 8 different strums). Nostalgic Hawaiian Songs, Vol. 2 packaged set of book/DVD/CD (for that song and 5 others with 8 different strums). CLICK FOR OTHER WAYS OF LEARNING from me from wherever you live.